This past weekend I had an open water swim on training peaks, and honestly I spent the entire week worrying about it. The open water portion of a triathlon does not bother me at all, well besides the mass start at Kona but that is a different story, but when I have to get out there by myself to train it brings me a lot of anxiety. here is something about the vastness and the unknown of the water that brings anxiety to head. For me in a race it is a whole different ball game; first I am focused on the race and second there are anywhere from 1500 to 2000 other humans all thrashing around in the water so I figure if someone is going to get attacked by those fresh water lake sharks or the Grindylows from Harry Potter (yes I a huge HP nerd) that I just know live among the seaweed are more likely to grab the ankles of some other swimmer rather than myself. The swim portion of the race is more often than not the reason that people don't try triathlon. We spend most of our time within the safety of the pool, staring at that little black line, so when we get into the open water with all that emptiness and darkness it can be really terrifying. 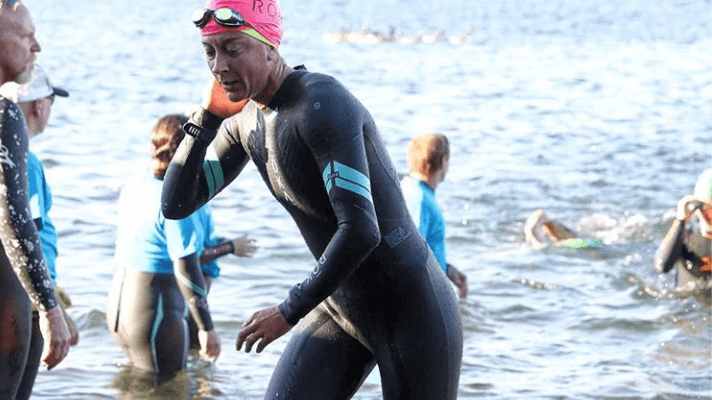 There are a dozen tips to help you calm the your anxiety when it comes to open water swimming, and everyone probably has something else that works well for them. However, here are a few tips that have helped me get through both the anxiety of training on my own in the open water and stay calm in a race. Find one thing to focus on. If you can take away the vastness, or the overwhelming concept of being in the open water it makes it a lot easier. I do that by finding one thing to focus on, even something as simple as my hand entering the water. Each time my hand enters the water I put all of my focus on that little piece. Get out there and practice If you are someone who struggles in the open water in a race than it is really important for you to step outside your comfort zone and get used to the water. It is no different than anything the more you practice the easier and better at it you will become. The more you can get into the open water the more you will you be able to adapt to the differences that each open water situation presents. It also helps you to learn to sight appropriately, because even though you can learn to sight in the pool it is very different when you are trying to use trees, buoys, homes, etc to sight. Even if you don't have much time to spend on actual swimming if you can go out in the water in your wet suit and bob around, getting wet, feeling the water, and realizing that it is not that scary. It helps to build your confidence in the water. This is very important. No matter how comfortable you may eventually get in the open water you really should never go alone. Always go with someone as there is safety in numbers and you really never know what will happen in the open water. Plus knowing that someone else is there with you helps to make you feel less small in the huge open water. I usually have my husband kayak with me that way he can keep me on track, scare away the fish, and move anything that may potentially be in the water. When we panic we start to hyperventilate and try to take in oxygen, our heart rate raises and our temperature increases. When you start to feel yourself panic rather than start breathing super hard slow your breathing in and out. Not only does this give you something to focus on besides your panic but the slow deliberate breaths can be therapeutic, they bring more oxygen to the brain and slowly allow you to relax. It is easy to let your form get a little more sloppy in the open water, or to forget to focus on it during a race because there are a bunch of people around you and you are more focused on the race. Remember to keep your head down to maintain good body posture, elbows high so that your whole arm comes out of the water, and keep kicking. Secondly, remember that more than likely you have put in more than enough training to be able to complete the distance and most likely you have already put in more mileage than the actual race. So you know that you can do it as you have already done it. Most importantly be patient with yourself when it comes to open water swimming. Finding comfort in it takes time, patience, and willingness to keep at it. I hope these help you to find peace with open water swimming and maybe, just maybe, help you to take the jump into triathlon.